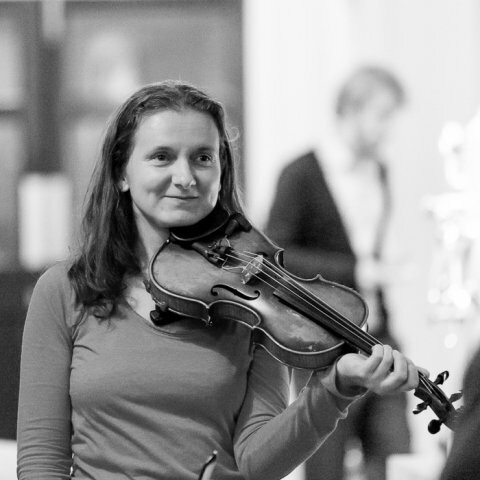 I am a violinist, improviser and composer based in Bristol. I like to play a range of styles including classical, eastern european folk, klezmer, jazz, improvisation and experimental. I play the violin in several ensembles at the moment including Porcini Trio (classical - piano trio), Halftone Quartet (improvisation/experimental), Hokkett (contemporary jazz/classical/improv) and also perform solo using violin, electronics, loops and effects. I've toured and performed at venues and festivals across the U.K. and Europe and my compositions have been featured on Radio 3 and Channel 4. I've taught violin for over 12 years: mainly beginners, improvers, returners, and those who would like to learn more about improvisation and the use of electronic effects. I've also led workshops for groups of children and adults. I enjoy helping students play the music that inspires them: whether that means working through grade examinations, studying technique and theory, learning to read music, or learning how to improvise and play by ear, or transcribing songs or pieces that they'd like to learn how to play on the violin. Lessons are relaxed and are tailored to suit each individual's needs and preferences. YvonnaFrom Errol (5/5): Thank you for your violin tuition. I found you friendly and full of good advice. You were very helpful considering I am a complete beginner on the violin. You helped me hold the bow correctly and gave me direction on adjusting the bow so that I could get the right tension. You were a great teacher and a valuable guide. I also enjoyed playing, twinkle twinkle little star.